This is the story of a little girl named Fern who loved a little pig named Wilbur - and of Wilbur's dear friend Charlotte A. Cavatica, a beautiful large grey spider who lived with Wilbur in the barn. With the help of Templeton, the rat who never did anything for anybody unless there was something in it for him, and by a wonderfully clever plan of their own, Charlotte saved the life of Wilbur, who by this time had grown up to be quite a pig. Este querido libro de E. B. White, autor de Stuart Little y La trompeta del cisne, es un clásico de la literatura infantil. Un cerdito. Humilde. Radiante. Estas son las palabras en La telaraña de Carlota, en lo alto del establo Zuckerman. Charlotte narra sus sentimientos por un cerdito llamado Wilbur, que simplemente quiere un amigo. Asimismo, expresa el amor de una niña llamada Fern, que salvó la vida de Wilbur cuando nació. Este libro ganador galardonada con el Newbery Honor es una tierna novela de amistad, amor, vida y muerte que permanecerá por generaciones venideras. Contiene ilustraciones de Garth Williams, el aclamado ilustrador de Stuart Little, entre otros muchos libros. 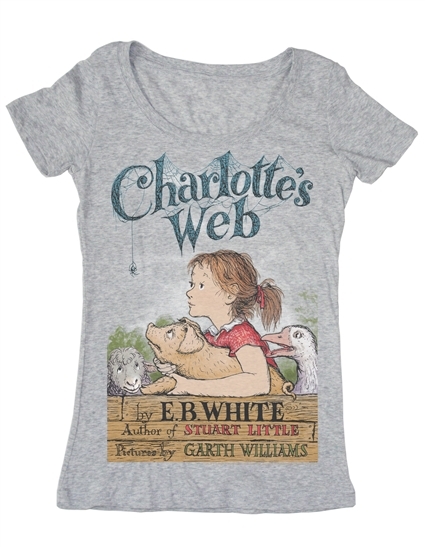 Purchase of this shirt sends one book to a community in need and supports children's literacy initiatives in the U.S. Size: Chest: 36-38" Length: 27-28"
Size: Chest: 40-42" Length 29-30"
Size: Chest: 44-46" Length: 29-30"
Size: Chest: 47-49" Length 30-31"
Size: Chest: 50-52" , Length 31-32"
Charlotte's Web cover image by Garth Williams. Size: Chest: 30-32" Length 27-28"
Size: Chest: 32-34" Length: 26-27"
Size: Chest: 34-36" Length: 27-28"
Size: Chest: 36-40" Length 27-28"
Size: Chest: 40-42" Length 28-29"
Large canvas tote bag featuring image from E.B. 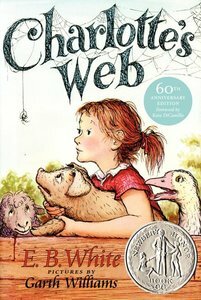 White's Charlotte's Web illustrated by Garth Williams. Please note: Tote bag is natural canvas color, not white as shown. Tote bag is jumbo sized, measuring 20" x 15" x 5" with long handles, making it easy to tote around all your favorite books! A squared, gusseted bottom gives extra room. From the first edition cover of Charlotte's Web by E.B. 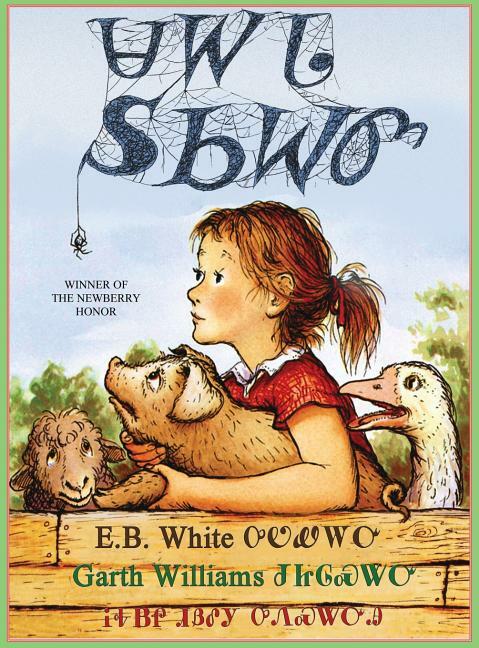 White, illustrated by Garth Williams. Pair with the book for a perfect gift! While composing what would become his most enduring and popular book, E. B. White obeyed that oft-repeated maxim: "Write what you know." Helpless pigs, silly geese, clever spiders, greedy rats-White knew all of these characters in the barns and stables where he spent his favorite hours as a child and adult. Painfully shy, "this boy," White once wrote of himself, "felt for animals a kinship he never felt for people." It's all the more impressive, therefore, how many people have felt a kinship with E. B. White.